Have you tried daikon? It’s a root vegetable that’s very common in Japanese cooking. It looks like a long white carrot and you’ll find one in nearly every Japanese household’s weekly grocery basket. They use it in salads, put it in their oden (stew), pickle it, or serve it as a garnish. 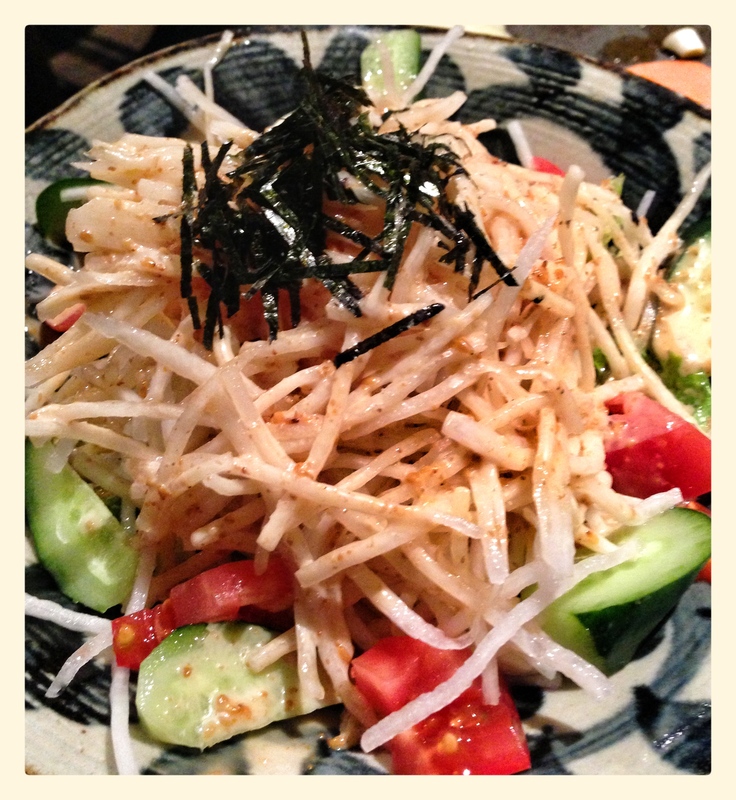 You can also see it grated on top of soba noodles (as daikon oroshi). It’s used throughout Asia and has many names but in English, the Japanese word, daikon or daikon radish, seems to be the most prevalent. Daikon is a mild-flavored radish that typically grows in the winter. While many Asian countries use daikon as an integral part of their cuisine, it hasn’t been as popular in North America where it is typically used as a fallow crop or to keep soil from becoming too compact. There are many varieties of daikon but the Japanese variety tends to look like an over-sized white carrot. Daikon can range in size from 6 to 14 inches long and up to 4 inches in diameter! Similar to potatoes in America, the daikon can keep for several weeks in cool, dry locations. The daikon’s mild flavor makes it versatile by complementing the flavors of the overall dish. For salads, I like how it adds a contrasting texture to the lettuce. I add it to Caribbean-inspired mango salsa for some crunch. Or thinly slice the daikon and add it to spring rolls. My sister even peels and then thinly slices daikon to serve as “chips” with salsa, hummus, or guacamole. The possibilities are unlimited for this root vegetable! This simple salad is one of my favorite ways to prepare daikon during the summer for a quick Japanese inspired dish. Julienne daikon radish and mix with sesame dressing. In a platter, spread some mixed greens along the bottom. Place sesame-daikon mix on top in a mound. Sprinkle tomatoes and cucumber around the side. Top with thinly sliced nori strips. Though this is typically served at New Years. I love the brightness yuzu brings to the dish. If it’s not winter, I typically omit the yuzu zest (or add some lemon zest) as long as I have the yuzu juice. While sadly I am not a huge oden fan, many of my friends rave about it and it is the perfect winter dish. Stewed vegetables and fish cakes always look great on those cold days! (From Mandy) One of my conversation partners also told me that you can use daikon as a remedy for coughs. Simply cut up a large slice of radish and soak it in honey. Then you drain the daikon out and drink the syrup. Any cough or throat irritation should disappear in a day.